Save the Children and Red Cross have participated in the first ever training on the Reach & Match Learning Kit, an innovative educational kit that empowers children with special needs and facilitates an inclusive learning environment. This training is in preparation for the implementation of the learning kits at Red Cross Special Development Centre (SDC) and in selected ECD centres in Malaita, Choiseul, Guadalcanal and Western provinces as part of Save the Children’s Play to be School Ready Early Childhood Development (ECD) project funded by the Australian Government. The five-day training was organised and facilitated by Save the Children Australia with close consultation with the founder of Reach & Match, Mandy Shuk Man Lau. 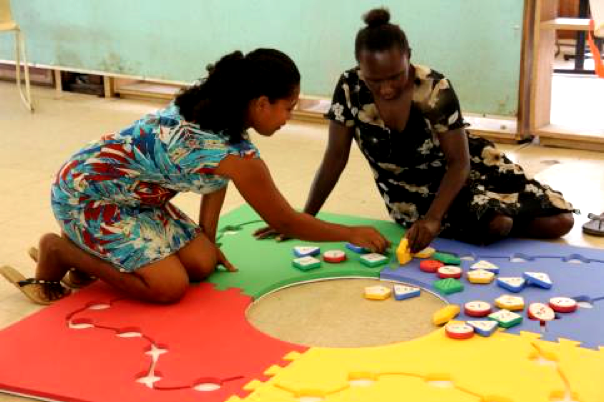 Participants in the training included Early Childhood Education Teachers from the SDC and Save the Children staff from the Play to be School Ready program. 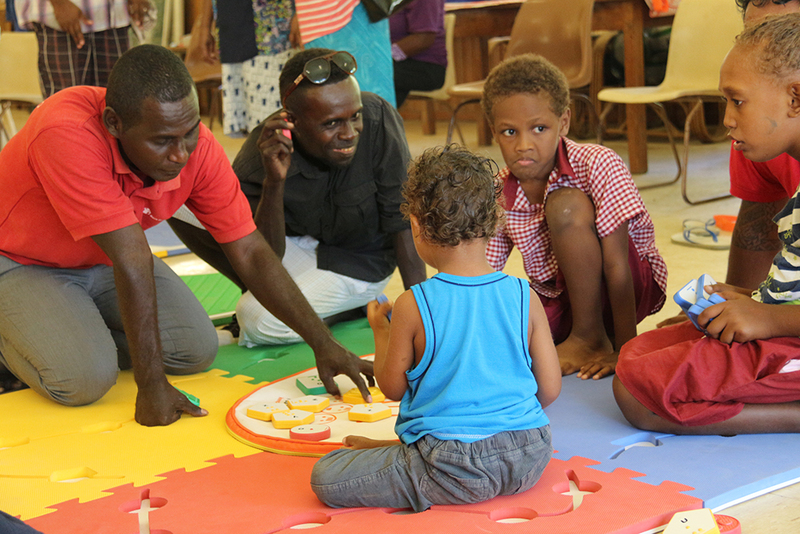 Save the Children Reach and Match trainer, Jason Ross applauded Save the Children Solomon Islands for being the first country in the world where Save the Children is working in to pilot the Reach & Match Learning kit. Reach & Match kit is given such a unique name because of its double sensory play features. The kit comes with joining mats with one side referred to as the reach side which provides toddlers pre-braille learning, learning with mobile symbols and playing with tactile patterns whilst the other side, is the match side for pre-schoolers that provide braille learning, motor development direct and space training. The additional features includes braille and print forms for both vision impaired and sighted children to develop literacy as well as essential childhood skills such as cognitive, motor, social and communication skills. The design and concept resulted from postgraduate research that was based on early childhood education and children with vison impairment and additional needs. It was developed and tested with early childhood educators, therapists, and psychologists for early intervention programs, childcare centres and schools. The design has received different awards in the Assistive technology, education and social inclusion field. The first two training days included an orientation of the kit and the different components with a focus on the activities and their outcomes. As the kit was designed to be highly interactive, all sessions were hands on and engaging for the participants as the trainer led them through the simple outcomes of each activities in the Reach & Match Training Book. Deputy Secretary General Clement Manuri who got involved in one of the sessions was optimistic about the application of the learning kit at the centre. SDC ECE teachers remarked that the kit is very inclusive for children with various special needs. SDC ECE teacher Mrs Lealyn Vunagi commented, “The learning outcomes can help us to develop new creative activities for children to develop their learning abilities. The next two days were spent at the SDC with participants conducting activities with parents and children. Parents were fully engaged with their children in a playtime experience with jumping, hopping, shaking the shapes and making tunes from the sounds of the shapes. In a short speech, one of the dads said “I feel so, so happy.” Other parents shared similar sentiments and were grateful to know there will be additional learning resources available in the centre for their children. When the Reach & Match kit was trialled with children, the design provided so many opportunities for all children to be engaged in games and activities. Children who have a visual impairment participated fully in alphabet games alongside sighted children due to each tile having the Braille component. Another young child who could not walk was the group leader. He confidently placed shapes into their correct place as his teammates ran towards him as part of the shuttle relay race. “The children have had an incredible time and will no doubt benefit enormously from the Reach & Match toolkit going forward,” Jason Ross mentioned.